You don’t have to sacrifice your diet to enjoy Chocolate for Valentine’s Day! We carry a full line of Lily’s Chocolates and Sweets. 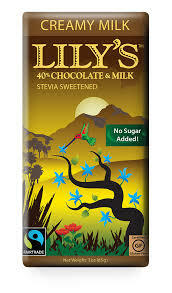 Lily’s is Non-GMO and gluten-free, harvested through Fair Trade practices. Every product is botanically sweetened—meaning no refined or processed sugars. The outcome? A chocolate with no added sugar that’s filled to the brim with pure deliciousness. Lily’s offers great alternatives for healthier baking. Check out the recipe below and come in to our Covington location today and get yours! In a microwave safe bowl, melt chocolate chips + coconut oil in 30 second intervals. Pour melted chocolate over a small rectangular or square pan lined with parchment paper (for easier removal at the end). Add toppings. Feel free to drizzle a little more melted chocolate over the top! Freeze 10-15 minutes, break into pieces and enjoy! 125 E. 21 st Ave.